Those present at the ceremony included UN Special Representative of the Secretary General in the DRC William Swing, DRC Minister of the Interior Denis Kalume, as well as PNC Inspector General John Numbi and MONUC Police commissioner Daniel Cure. 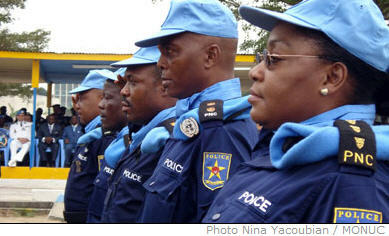 Two of the 12 PNC officers have already departed to commence work in MINUSTAH, the UN peacekeeping mission in Haiti. The remaining 10 officers, who were present at the ceremony, are expected to depart in early September for MINUCI, the UN peacekeeping mission in the Ivory Coast. Mr. William Swing hailed the PNC Inspector General for the initiative. “What pride to be present at this historic event in which the first PNC officers will work as “blue berets” in two UN peacekeeping missions, and it is a strong signal to the world that Congo is in the process of regaining its proper place of leadership for the African continent, and in international affairs,” he said. Two female PNC officers - Colonel Henrietta Kitoko and Major Neneh Musavuli - are among the 10 officers that will represent their country in MINUCI. “It’s a great joy to see my country- the Democratic Republic of Congo- to be joining other countries in assisting the countries that have a need, that have problems and conflicts, like it was in my country. I’m very proud to represent my country as a police officer,” said Col. Kitoko.